At Peace Church we exist to become Jesus followers, internalizing the gospel like the Good Samaritan, so we can serve our neighbors. But what does that look like? To answer that question we need to look at the life of Jesus, the ultimate Good Samaritan, who embodied the gospel. Internalizing the gospel is not me living for Jesus; it’s Jesus living his life IN and THROUGH me. As we study Jesus in the New Testament, we find that his life was all about relationships. First his relationship with the Father, second his relationship with this disciples and third his relationship with people who didn’t know God at all (the world). So what does the life of Jesus look like? Answer: Relationships! At Peace, we use three key words to describe these relationships. The first word is ABIDE. A Jesus follower abides in Christ personally and daily. The second word is CONNECT. A Jesus follower connects in community in large group and small group. The third word is SHARE. A Jesus follower shares in the mission locally and globally. The life of a Jesus follower is all relationships. So how do you deepen these three relationships and grow as a follower of Jesus, internalizing the gospel to serve your neighbors? It’s TIME! 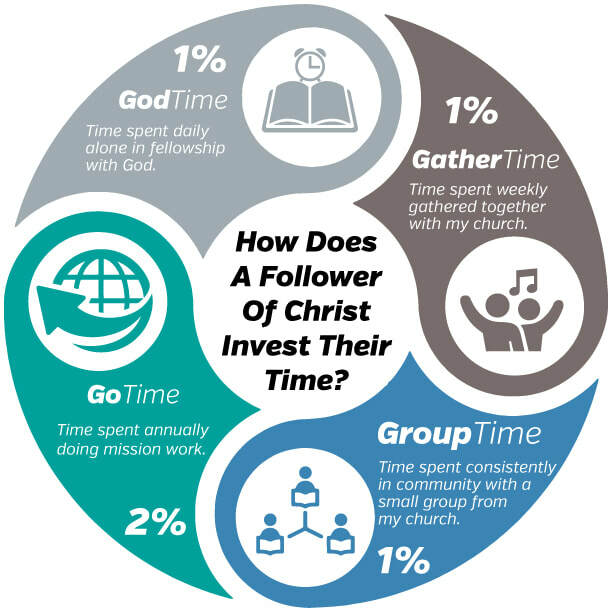 How do you invest your time as a Jesus follower to deepen your relationship with God, your relationship with other believers and your relationship with the world? God Time: Time spent daily alone in fellowship with God. Gather Time: Time spent weekly in gathering for worship with my church. Group Time: Time spent consistently in community with a small group from my church. Go Time: Time spent annually in mission, serving our neighbors locally, nationally and globally. As you invest your time in these ways we believe you will deepen your walk with God, grow in community with your brothers and sisters in Christ and engage in God’s mission in greater ways. So you may be asking, “Where do I start?” Well, you start small. It’s been said, “the journey of a thousand miles begins with one step.” So we want to introduce you to your first step. We’re calling it the 5% Life. 1% of your day, approximately 15 minutes, in God Time daily. 1% of your work -week, approximately 1.5 hours in Gather Time weekly. 1% of your month, approximately 7 hours in Group Time, consistently in community with a small group. 2% of your year, approximately 7 days in Go Time annually, serving God in mission. We are convinced that if you embrace the 5% Life as a starting point the other 95% of your life will be changed forever as you abide in Christ, connect in community and share in mission. Abiding, connecting and sharing is the path to internalizing the gospel, becoming like a Good Samaritan and serving our neighbors. Sometimes it can be overwhelming to change courses and start a new journey. We have prepared the following devotions that address common questions that can keep people with good intentions from following through. Where in the Bible do I start?